Rosemary adds an earthy, robust flavor to these savory scones, while sour cream and ricotta cheese make them extra tender. Make a double batch and freeze half to have on hand for breakfast, afternoon tea or snack. This recipe makes 12 scones. Combine the first 8 ingredients in a large mixing bowl. Cut in the butter until mixture is coarse and crumbly. In another bowl, mix together the egg yolk, sour cream and ricotta cheese. Stir the egg and cheese mixture into the dry ingredients until just moistened. Turn dough out onto a lightly floured surface and knead 10 times. Using the palms of your hands, pat and flatten the dough into two 6-inch rounds. Cut each circle into 6 wedges with a sharp knife. Transfer wedges to a lightly greased baking sheet. 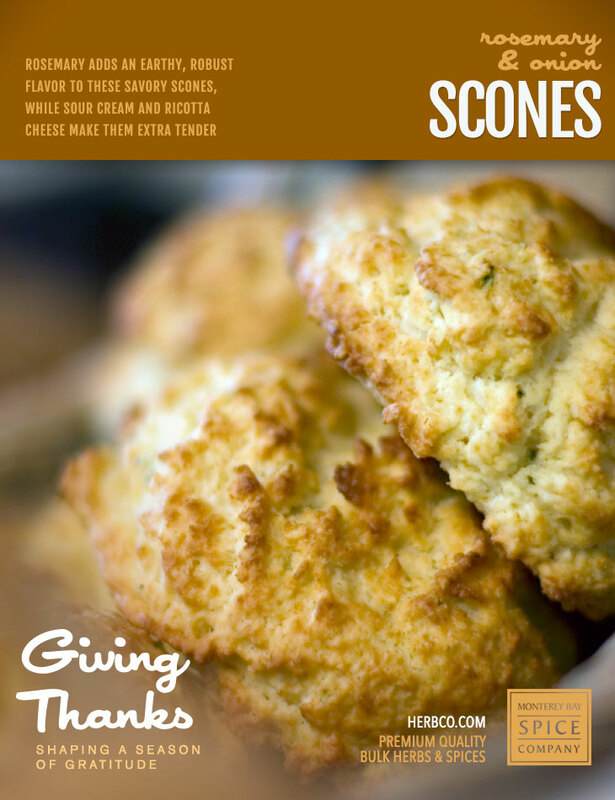 Brush the tops of each scone with cream. Bake scones for 16 to 18 minutes, or until golden brown.